And just like that, we reach the end of season 1 with these two episodes. First up is The Beast From the Belly of a Boeing. This one was written by Patrick Hasburgh, and aired 3 May, 1983. A group of terrorists, led by Jackson (Andrew Robinson) and whose men include Xander Berkeley and Jesse D. Goins seize control of a Beller airlines commercial flight, and are holding it and its crew and passengers for ransom. 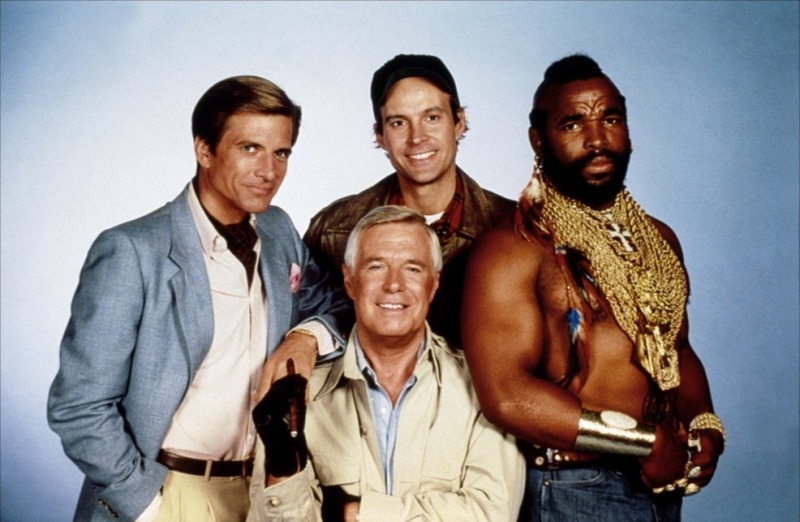 Hannibal (George Peppard), Face (Dirk Benedict), Murdock (Dwight Schultz) and B.A. (Mr. T) are contacted by one of the company’s executives, and Hannibal hits upon the idea that he’ll pose as Beller with Face taking on the role of his VP. They offer to exchange themselves for the passengers, along with the ransom money, while Murdock, whose doctor at the V.A. hospital has declared him sane (despite a non-appearance by Billy the dog), and B.A. sneak aboard and take care of everything before they can get back in the air. Things don’t go quite as planned as Hannibal is rumbled shortly after boarding, and the plane takes off sooner than expected, plunging B.A. into a catatonic state. 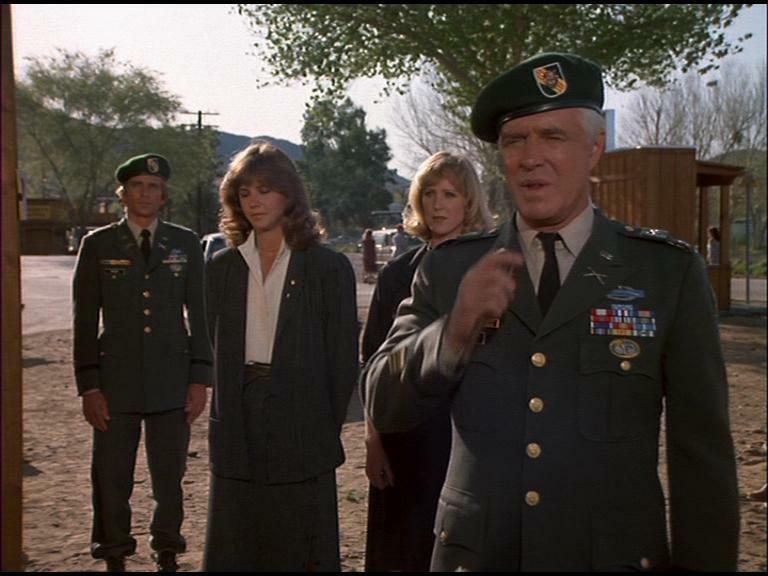 This leaves Murdock to lead the charge of the rescue, if he can come up with a plan, or can rouse B.A. The final episode of the season A Nice Place to Visit, was written by Frank Lupo with an airdate of 10 May, 1983. The team is headed to a small town to attend the funeral of a former Vietnam comrade, Brenner, but the local Watkins clan, who bully and strike fear into the entire town, have declared that no one will go to the funeral (and they may have had something to do with Brenner’s death). This family stirs up trouble, and after making sure that Trish Brenner (Joanna Kerns) is alright, think about exacting a little bit of revenge. While Amy (Melinda Culea) stays with Trish, the team aims to straighten out the baddies, but the Watkins get the drop on them, and end up driving them right our of town, literally. Then, just like First Blood, the boys head back into town to exact their vengeance, and dole out some justice, restoring the freedom of the town, and revealing the Watkins as the cause of Brenner’s death. There are some nice moments, we get to see all four of them in their dress uniforms, each of them gets a flashback around the gravesite recalling their time with Brenner, and it allows a brief look at the horrors of the war, and of course, having them get knocked down before coming in and saving the town once and for all is classic hero stuff. Wonder what will happen when I start Season 2? Previous Post State of Women: Return Engagement!!! !